Nitric Oxide (NO) is neither a mineral nor a vitamin. It is a gas produced when a group of enzymes in the body break down the amino acid Arginine. 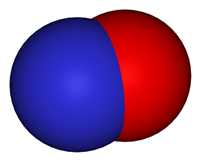 NO contains one atom of Nitrogen and one of Oxygen and is mainly involved in intra-cellular communication. In other words, it is a key signalling molecule in human health that acts in many tissues to regulate a diverse range of physiological and cellular processes. Nitric Oxide can act as a hormone, a neurotransmitter and an intracellular messenger. It is required for key physiological functions within our body. There are three isoforms of Nitric Oxide Syntheses (NOSs) in the body. The role of Nitric Oxide in a variety of biological processes in the body appears to be of great importance. For example, NO has been shown to play a role in the immune system. Certain immune cells produce NO to help in destroying and removing foreign bacteria. Additionally, NO plays a role in the cardiovascular system – it is critical to the widening of the blood vessels, muscle relaxation, and the regulation of blood pressure. Deficiency of NO is now associated with cardiovascular disease, inflammatory disease, male erectile dysfunction, extreme fatigue and physical weakness. Hence, it is essential that the cells produce adequate amount of this gas within our bodies. The effect of Nitric Oxide in the body was first observed by several groups of scientists who was trying to identify a source promoting blood vessel relaxation and regulating vascular tone. In the earlier studies, researchers adopted a generic term “endothelium-derived relaxing factor” (EDRF) whichspan was initially attributed to a protein (like most other signalling molecules). Later, they realised that EDRF was in fact a highly reactive gas – Nitric Oxide – with a life of a few seconds. This discovery instigated a lot of interest in this field that resulted in thousands of papers published on this topic and The Nobel Prize in Physiology or Medicine 1998 awarded jointly to three American scientists Robert F. Furchgott, Louis J. Ignarro and Ferid Murad “for their discoveries concerning nitric oxide as a signalling molecule in the cardiovascular system”.